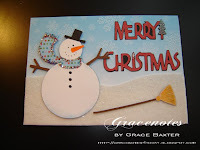 I enjoyed making this little winter scene featuring a rolly-polly snowman. The snow layer is cut from thin, sparkled felt. The snowman and broom were from Christmas Cheer. The phrase Merry Christmas was cut from Beyond Birthdays. For the face of the snowman, I had to cut a blackout layer in black so that his eyes and mouth and buttons would show up black.